As we stood to sing, I glanced around the room quickly. Oh, how many stories there were in that room. Stories of triumph and failures, happy and tragic endings, healing and sickness and pain and suffering. But most of all, the room was filled to overflowing with His grace. Thinking of my own story, my eyes filled to overflowing with tears and I quickly wiped them away. I think of how many times I feel I've failed not only myself but also Him. In those failing times, I've allowed the enemy to make me feel not worthy. To make me feel like, just as Adam and Eve hid their nakedness from God, I felt I had to hide my failure from Him. How many times I've given it to Him only to take it back. I can only imagine how that must break His heart, to think that I don't trust Him enough to give my failures to Him completely. Notice that the Lord explains how I’m all the grace you need actually works in our lives: “For my power is made perfect in weakness.” “Perfect” means fulfilled, accomplished, completed, finished. It’s the same term Jesus spoke as His final word on the cross, tetelestai, which means, “It is finished” (John 19:30). God brings His sufficient and powerful grace to the relationship; all we bring is weakness. All of this is grace because we can’t do anything to deserve what He does for us. And He makes sure the results are perfect and complete. God wants His grace to be completed in your weakness. You never really experience the grace unless you see the need for it—and even that realization comes by grace. The power of Jesus' grace is not fully seen until weakness is fully acknowledged. The moment you are overwhelmed with your absolute helplessness is the moment you are ready to hear Jesus say, I’m all the grace you need. Reading this took me instantly back to the day my husband told me he was leaving. I sat on the bed, watching him pack. I was hysterically crying, telling him I couldn't do this without him. I couldn't live without him. Two days after he left, the kids and I sat in the living room watching Jonathan Falwell and immediately I felt that we should all get together, hold hands and pray. As soon as that prayer ended, I felt peace. In my moment of absolute weakness, He gave me the grace I needed. Throughout our lives, we've all faced struggles. Every single one of us. We've all had seasons of storms when it seems you can't even see the shore. These are as much a part of life as the sun rising each morning and setting each night. Whether your season comes in the form of a health issue or simply feeling like a failure, we all know what struggling feels like. Every single one of us. It's not a good feeling. And normally, it's not pretty. At least for me it's not. It normally ends in me ugly-crying through singing hymns in church. What makes the struggles a little easier to bear? Knowing we have someone to lean on. It’s so comforting to know that during those times, we are never ever truly alone. We can take our problems, fears, failures, concerns, tears and the worlds lies to Him through prayer and have Him grace us with strength, wisdom, patience and compassion. We need to allow our struggles to remind us to lean on Him when we are weak, tired, sad, broken and need to be nurtured. He will meet you right where you are. And He will gently lead you through it with His grace. When I suffer and when I fail, I want to do it with faithfulness. Whatever I am going through, I want to be faithful to God...even when I don’t feel like it. Join me as I express those feelings to God today. Leave them there with Him today. He is big enough to handle them. 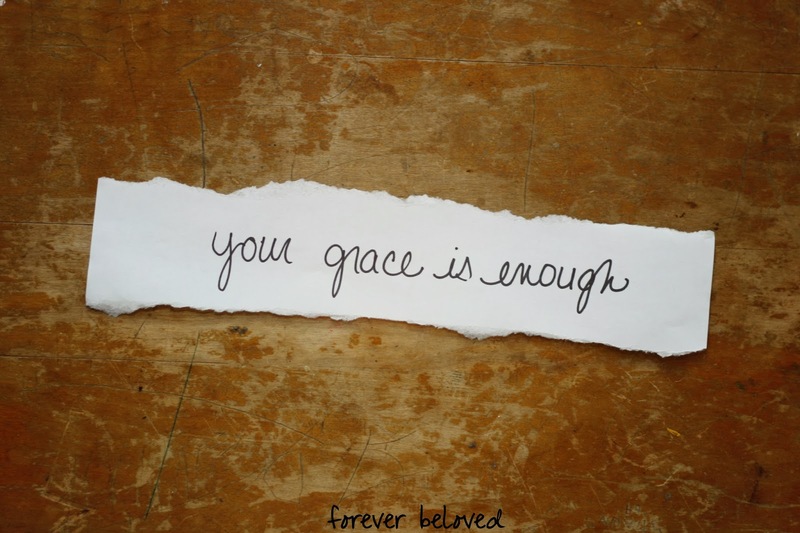 And His grace is enough… for me and for you.